The Lehmann Company is a German toy manufacturer founded by Ernst Paul Lehmann, most famous for their colorfully lithographed and detailed mechanized tin toys. 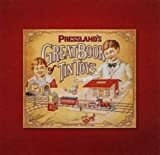 While the company was founded in the 19th century, it came into prosperity in the early 20th century when it switched to making lightweight yet intricate tin toys in popular themes at a time when most other toy manufacturers were still making only heavy iron toys. In addition to being lighter and easier to play with, they were able to be lithographed with detailed graphics and vivid colors not possible with iron toys and were more affordable too. 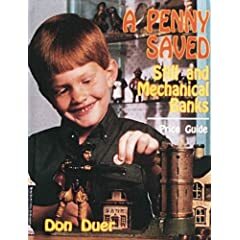 The company made tin toys in many different sets with both human figures and many different animals such as mules, ostriches, donkeys, and zebras. Most were whimsical and with some attention grabbing theme or capability- a monkey climbing a pole, a tap dancer tapping, a skier skiing, and tin cars with a horn that blows, a father who swipes his hand at his "Naughty Boy" in the front seat. 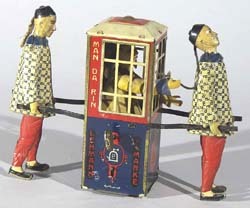 In fact, all Lehmann tin toys have names with most embossed on the actual toy; names were both descriptive and fun such as the "The Boxer", "Balky Mule", "Tut Tut", or "Paak-Pak" (a duck pulling a bucket of water with her 3 ducklings swimming around when wound). Most Lehmann toys are marked, either with a logo or with the name embossed on the piece. Like any old tin toy, price is highly correlated to condition and having the original box although any early Lehmann tin toy will bring strong prices. 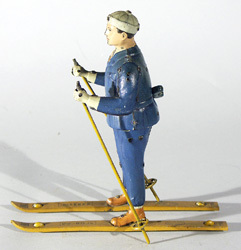 While not as reproduced as other early manufacturers of tin toys, we have seen fakes marked Lehmann so be careful. The Lehmann Company is still in business today, but their peak years of production and the most highly collectible period is from about 1905 through the early 1950s. 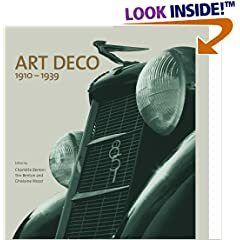 While they remained in business post 1948, the company had been occupied by the Russians after World War II and models made after this time typically to not have the same quality or collector interest. Buy period Lehmann, Marx, Disney, Lionel, and other finer collectible toys on the Collectics Toys and Fine Antiques pages, or search the entire site for great antiques, collectibles, and crafts for every collector!